The fin is located under the Boeing 787 APU exhaust as shown in the picture below. Does anybody know the application of this thing or it is used for 'guiding' the APU exhaust? Thanks. Energize (or trip) boundary layer airflow. The latter are normally perpendicular to the surface on which they are mounted, allowing them to protrude directly into the boundary layer of air flowing over the surface. You can picture the effect of these types of devices by looking a how water flows over and around a boulder in a stream or river. "Tripping" the flow mixes the boundary layer with the more energetic air outside the boundary layer. It is most likely the former, a device used to direct the airflow. By the time air gets to the tail of an airplane, to the aft most part of the empennage, it is quite unsteady flow. (In this case, imagine the water flow behind a large ship.) The turbulence characteristic of this type of flow can wreak havoc for designers who want to vent exhaust gases or airflow out of the aircraft's APU. This turbulent flow can create stagnant zones which would block the air from exiting the way intended, as described here. By directing the flow of the air around the exhaust duct, this can be minimized or avoided altogether. There is, however, probably a small amount of the boundary layer that gets energized by this device, which would further help the designers manage the flow. 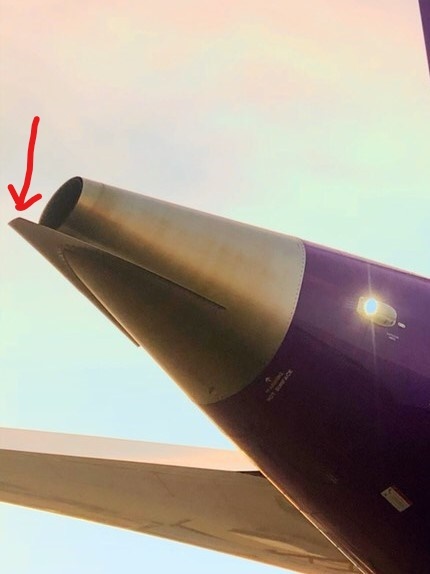 The article previously cited calls them vortex generators, which are explained in more detail here and correspond to 2 above. Fuel that was pooling in the APU was a result of the stagnation of the flow. Mark Jones Jr.Mark Jones Jr.
Not the answer you're looking for? Browse other questions tagged aircraft-design aircraft-systems boeing-787 apu or ask your own question. What type of engine/motor is used in aircraft APU? What components of the Boeing 787 are made out of titanium? What is an “all-electric APU”? How does this very long tube deployed from the back of a 787 measure pressure?